The RS-PMWF55 Rain Slicker is made from waterproof Nylon Taslan material and complemented by a soft Tricot interior layer. In addition to being waterproof (1000MM waterproof rating) the Taslan material is breathable (1000G/M² breathability rating), allowing heat from the camera to escape while the cover is deployed. It includes 3 interchangeable front-end attachments for use with cinema lenses, zoom lenses, and matte boxes. The 2 front-end attachments not in use can be stored in a pocket on the body of the Rain Slicker for convenient access. The back end of the cover adjusts to accommodate different battery and recorder configurations. The RS-PMWF55's unique expandable design covers a variety of rails and mounts and multiple input / output access points make the cover adaptable to add-ons such as monitors, recorders, and microphones. There's also a versatile viewfinder cover that accommodates different viewfinder types and positions. Top access allows for mounted accessories. 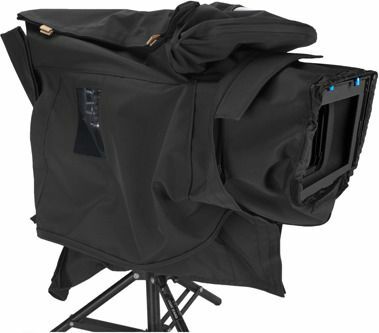 - Accommodates a variety of lens types, including Matte Boxes. - Includes long-lens cover attachment.